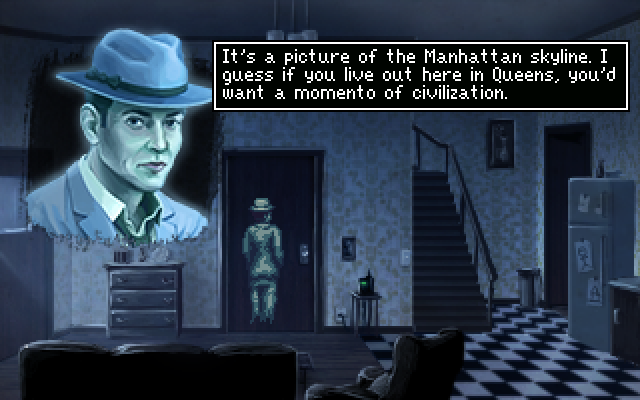 Today’s the launch day for The Blackwell Epiphany, the fifth and final entry in the Blackwell indie adventure series. In it you play as Rosangela Blackwell a spirit medium or “bestower of eternity” who helps guide lost spirits to the other side. Your partner is Joey Malone, a spook who’s been dead since the 1930s, and who has been tied to the women of your family since your grandmother got stuck with him. What this practically means is a lot of detective work. Spirits don’t know who they are or even accept that they are dead in some cases and it’s your job to find out and help them to accept it. 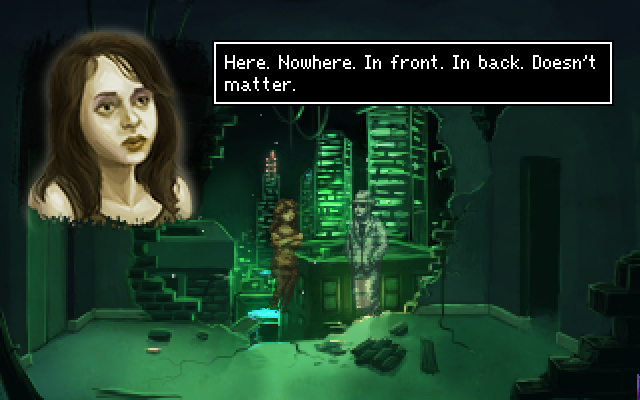 In the process you uncover crimes both terrestrial and supernatural. Each game is only about 3-5 hours long so it’s better to think of them as episodes in a season long game like the work that Telltale is doing (even though the first entry in the series was released in 2006). This last game is supposed to be the longest yet, taking its creator (who presumably knew the solution to everything) 5 hours to complete. 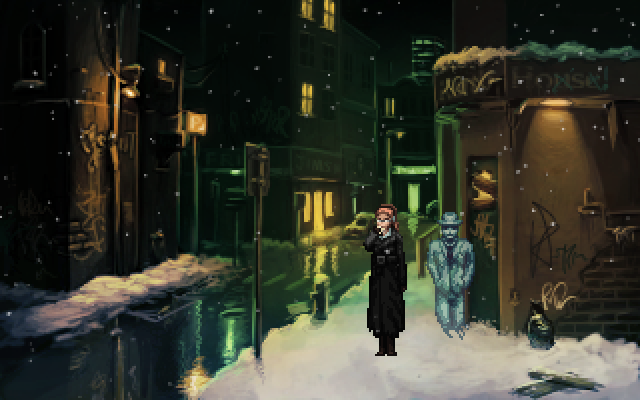 The Blackwell Games are a bit of a throwback, point and click adventure style games using pixel art that was present in games of the early 90s. Think Sierra’s “Quest” titles or LucasArts later SCUMM games. The developer (a four person team out of New York), Wadjet Eye Games, has produced a long series of games using the Adventure Game Studio engine, all of which are quality titles well worth the playthrough. Particular favorites of mine are Resonance, Primordia and The Shivah (Wadjet Eye’s first real game). I played through the extended demo available on GOG and Wadjet Eye’s website and can’t wait for the released version later today. Gameplay has definitely improved since some of the earlier entries in the series, Rosangela uses her phone to look up clues and contact people rather than always having to travel back to her apartment and use her computer. One of the first puzzles is how to get inside a locked building (a handy trope of the series which involves sending your ghost envoy Joey in first, even though he can’t touch anything). The solution’s not the most obvious from the clues given, but most of the rest of the puzzles in the demo are solvable with a little thinking, and judicious use of each character’s unique abilities (Joey can’t touch anything but he can blow light objects like paper in your direction). What I love about these games is the engaging mystery, amusing character dynamic, and fun puzzles that aren’t as obtuse as some older adventure games. It’s the best of games I played as a kid with less of the frustrations. The voice acting in the series can be a little over-dramatic at times, but I think that’s part of the indie charm, and what other series let’s you hear bloopers of the voice actors recording their characters after you complete the game? And let’s not forget the music (the soundtrack for this game is over an hour), a mix of jazzy and electronic tracks that really set the tone of a cold New York night. I can’t wait to play the rest of this game. Why are souls being ripped in half and will Rosangela be driven to the brink of insanity like her relatives? Why is Joey bonded to their family and is there an achievement for drinking coffee 50 times? Do yourself a favor and at least check out a demo of the first game on Wadjet Eye’s site if you’ve never played this series. Or alternatively you could watch a let’s play of the entire first game here.